If you want a consistently good whiskey-based cocktail, get some whiskey and let Dr. Thacher handle the rest. That's the idea behind Dr. Thacher's Cocktail Syrups, a new product that's a joint venture of two Chattanooga businesses: Pure Sodaworks and the Tennessee Stillhouse, a micro-distillery opened by Chattanooga Whiskey. 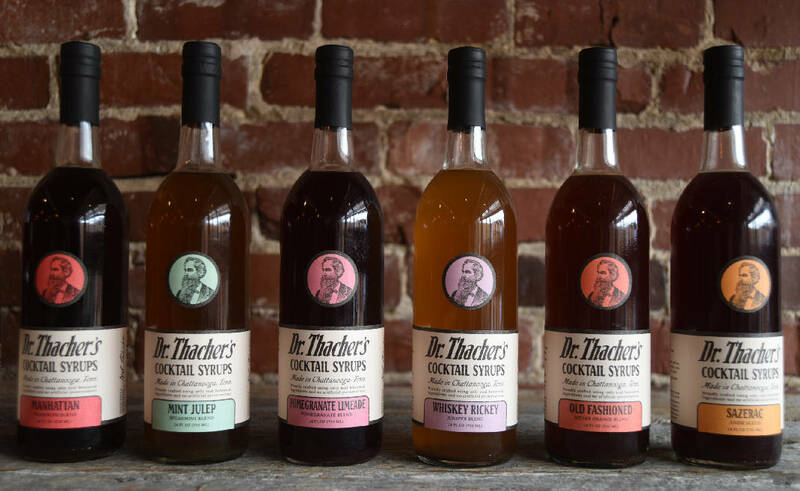 Dr. Thacher's comes in six flavors: old-fashioned, whiskey rickey, mint julep, Manhattan, Sazerac and pomegranate limeade. To make a cocktail, you fill the small side of a cocktail jigger with the syrup and then add whiskey from the jigger's big cup. "The entire point of Dr. Thacher's is it's a two-bottle cocktail without having to mess with a whole bunch of different ingredients," said Matt Rogers, who spent months devising the cocktail syrups in the test kitchen of Pure Sodaworks, the organic, artisan soda company he co-founded. The cocktail syrups have been featured at the Tennessee Stillhouse since the micro-distillery opened in March at 1439 Market St. across from the landmark Chattanooga Choo Choo hotel. Visitors who pay $12 for a distillery tour get a flight of six diminutive whiskey drinks at the tour's end: two shots of straight bourbon and four tiny cocktails made with Dr. Thacher's Cocktail Syrup. Necessity was the mother invention for Dr. Thacher's. Ordinarily, cocktails are made with a mix of different spirits. For example, a classic Manhattan is whiskey, sweet vermouth, bitters and a maraschino cherry. But the stillhouse can only serve alcohol it produces. It doesn't have the luxury of combining its bourbon with other spirits. So Dr. Thacher's Cocktail Syrups are a non-alcoholic mix of simple syrup infused with ingredients that mimic the flavor of classic cocktails. "These are botanically infused syrups that are carefully balanced," Rogers said. The Manhattan syrup has 14 different ingredients, Rogers said, including wormwood, a component of vermouth. "That was one of the hardest ones for me to develop," he said. Besides simplicity, another advantage to Dr. Thacher's, its inventors say, is the flavor is consistently good — something that can elude home mixologists. Dr. Thacher's recently became available for retail sale at some Chattanooga liquor stores. It's also sold at the stillhouse. 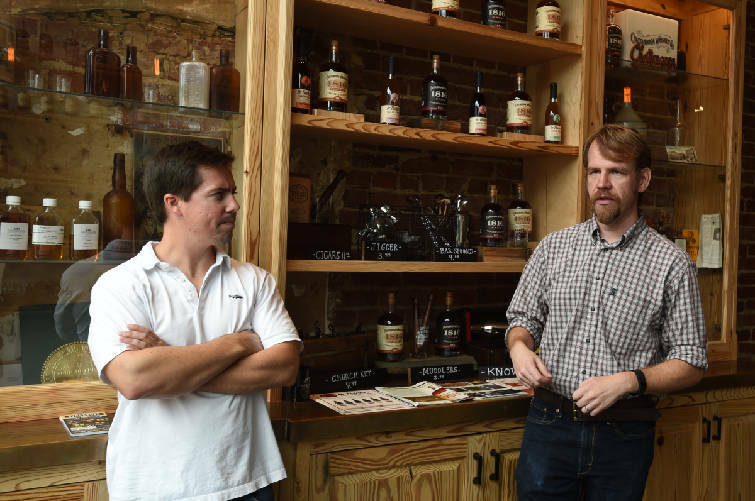 It comes in 12-ounce bottles for home use that retail for between $10 and $12 and in 24-ounce bottles for bars and restaurants, said Tim Piersant, CEO and co-founder of Chattanooga Whiskey. He plans to expand Dr. Thacher's sales to the three states where Chattanooga Whiskey is sold: Tennessee, Georgia and South Carolina. Dr. Thacher's gets its name from a patent medicine that was made in Chattanooga from post-Civil War days till the 1920s, Piersant said. Dr. Thacher moved to Chattanooga from the Northeast and is buried in a Catholic cemetery somewhere in town, he said. The stillhouse has a collection of Dr. Thacher's original packaging and bottles on display in a glass case near the front door. The cocktail syrup borrows its design from the original patent medicine, which wasn't trademarked. "It's trademarked now," Piersant said.